What makes a university great? Its faculty? Its students? Its curriculum? All three to be sure. But also its architecture. Great buildings inspire. They transform how we think, how we see, how we learn—how we act. No one who enters the cathedral of Chartres is the same person coming out. Too often architectural critics focus on theory and analysis of a building rather than the visceral experience of seeing it and being in it. Van Doren is more interested in the stories, in how Yale’s buildings made people feel, not just the academic origins of their style or where their bricks were made. What was it like to live in them, to study in them? What did people remember? 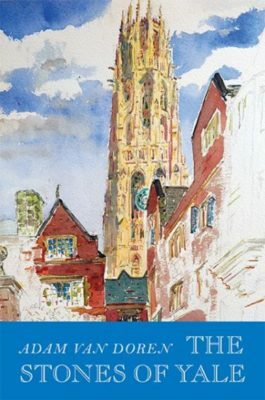 Painter Adam Van Doren speaks to Yale alumni as diverse as actor Sam Waterston, writers Christopher Buckley and David McCullough, Yale librarian Judith Schiff, former NFL great Calvin Hill, architect Cesar Pelli among others, and illustrates his book in gorgeous watercolor paintings of the buildings of Yale that interest him most.